classic campbell: A Christmas Giveaway! I really love having a blog. It is a way for me to share my kids and my thoughts and my projects with my family and friends and others who read. Last week I logged on to find that 100 people are following my blog. The next day, there were 101. It's funny to me that 100 people want to stay updated with what I have to say. I realize that there are blogs with hundreds, thousands of followers and countless other readers. So I know I'm small potatoes, but 101 is still a big number to me. So please take this Christmas giveaway as a thank you. 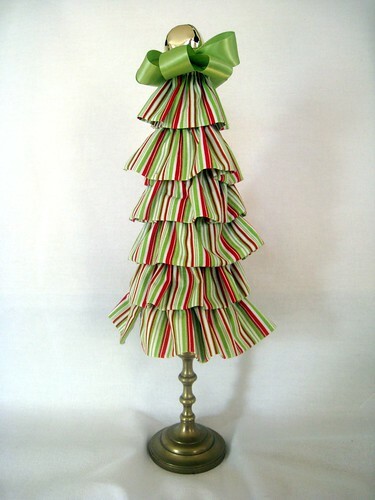 I took one of these ruffle trees to a craft show, thinking that no one would want it, but figured it would add some color to the display. I might have gotten more comments on that than anything else on the table. Last week I posted these pics on my facebook page. Immediately people wanted to know if they were for sale. And I don't mind selling the ones I have already made, but I can't take orders for them now. I didn't realize they would be a big hit. But I will make them throughout the coming year and will be stocked up for next Christmas. Saying "no" to making more right now is my Christmas gift to myself. And a pretty hard one to give, if I'm going to be honest. So since I have these on hand (minus the candy cane stripe), I'm going to give one to a reader. Well, to a commenter. If you want a chance at a tree, just leave a comment on this post. You don't have to be a follower. You don't have to like me on facebook. You don't even have to say anything meaningful in your comment. Just a "hi" or a "Merry Christmas" or anything that's on your mind. I surely would be bummed if you all stopped following or stopped reading. But I would keep going. Because this page is a scrapbook of my life. And like with paper scrapbooks, we put photos and memories of things that make us happy. Our scrapbooks might not tell all the tales, because we want to be able to look through them and smile. So you know that there are ups and downs at this house, but I'm only taking pictures of the good things. And looking back at what I hope is a long list of comments will be a good thing for me. And hopefully winning a tree will be a good thing for you! Although I love Auntie Kay very much, I also would like one of these trees!!!! Maybe I will be an elf and help you make them for next year. You are so creative and resourceful that I can hardly believe you couldn't or wouldn't sew a hem or a put a button on when you lived with me! These trees are one of my favorite things that you have ever made. I think one of these trees would look perfect in my new house! Cheers for you for giving yourself the gift of saying no! It's a hard gift to give, but one that is very valuable. Good for you!! Btw, I *love* my holiday bucket liner! I know the photo I posted to your Facebook wall isn't great, but hopefully it gave you and your followers an idea of what I've done with it. I LOVE your trees!! (Emily sent me!) BTW, my name is Anna Jane like your daughter! I especially love the one on the far right with the carolina blue! So cute!! Merry Christmas! These trees are adorable! 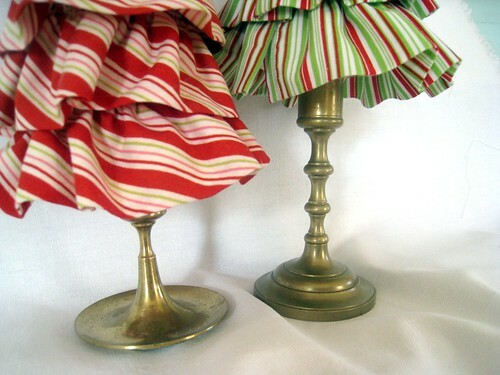 I would LOVE the stripe one or the peppermint stripe but apparently someone else liked that one too and bought it from you! Have I told you lately just how talented you are and you are just amazing at what you can create! Am I sucking up to win????? YES!!!!!!!! Seriously, I love seeing all the new things you design,I only wish I was as talented and creative as you are! Wishing much more success,in your following and business! they are so cute. you should make lots for next year and put them in a craft fair. Katherine, I am alway amazed at what I learn and discover about all my talented JLWS friends. It is very humbling to a non-crafty person. 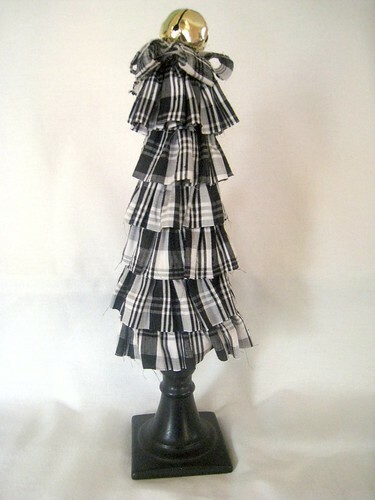 I think these tree would be a hit at Bootique. I love these trees! Looked at one today made from coffee filters. I thought about making one - and still might - but if you would just let me win one I would not be adding another project to my list! Besides it should stay here in NC. Love you blog! Aw these are too cute! You are so creative!! I love the trees and would Love to win. Are you going to share how you made them? That would be awesome as well!! I LOVE them! You are amazingly talented, Katherine. I think these are so cute! Emily just told me about your blog. Your daughter looks JUST like you! I wish I had that same kind of luck with my girls - guess we'll have to keep trying...haha. I'll give you a little shout-out on my blog too! Good luck on making these for next year - they'll be a hit - so original and creative! 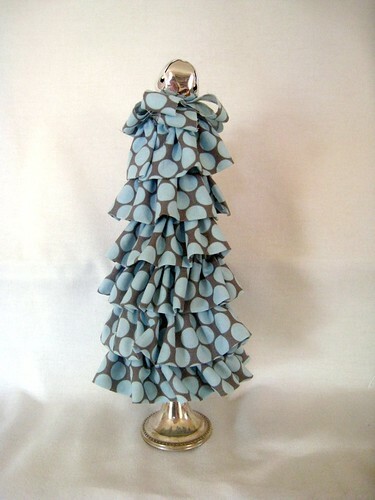 I ADORE these trees and would love to win one!! So cute! Such cute trees! would love to win one! So cute! Love them all!! These are precious! Love them! The red and green is my favorite! Coming by from Anna's site (Mama's Messages). Looking forward to following and learning more crafty ideas! I'm so happy that I found your blog and would love to be included in this giveaway. 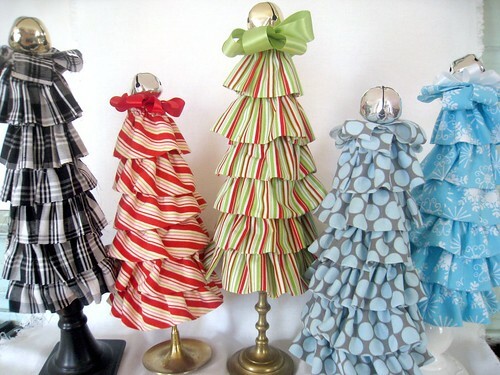 These ruffle trees are beautiful and so creative. I look forward to reading more and I hope that you have a Merry Christmas! Those are precious!!! I'm a new follower!! Absolutely adorable trees! Have a merry Christmas!! These are so great! Wow, I would have never thought to make something like these. They are awesome. I would totally buy one,winning one would be fabulous too! I can't get over how lovely they are! These are adorable! I would love to have one and if I don't win, I will just keep following so I can buy one next year :) Merry Christmas!! Too cute! I think I would leave this up year round. Dying for one of these! They are so cute! I am your newest follower, #115, so glad I found you, these are darling! I will definitely order one next year (I hope you will do pink & green) for now I hope to be the lucky winner! Those are absolutely adorable and I think one would look amazing in Lily's bedroom. Merry Christmas! Reallyyyyy cute. I'd love one! Ack, I love these too!! GREAT idea. Love love love it! Saw them on FB and loved them there to. I'm sure you will have orders out the wooha! Hope I win so I can have one this year. Those are the cutest things I have seen all season! Congrats! Love them and would love to win one. Thanks for the give away. and decided it was time to become an official follower! you are so talented and love to read your blog when I can...hard right now with a 16 day old baby..but stopped by just now to say wow! love the trees! and I want to get a Happy Birthday banner for next year...no rush. Merry Christmas! These trees are precious!!! I would be delighted to win one!